With the Easter holidays, I have been slightly busier than usual and have not been able to spend time blogging as much as I would have loved. The weather is nice for a change and we have been busy exploring the outdoors with my daughter. During this time i have prepared many dishes but have not been able to perfect the dishes or take decent pictures to actually do up the blog. 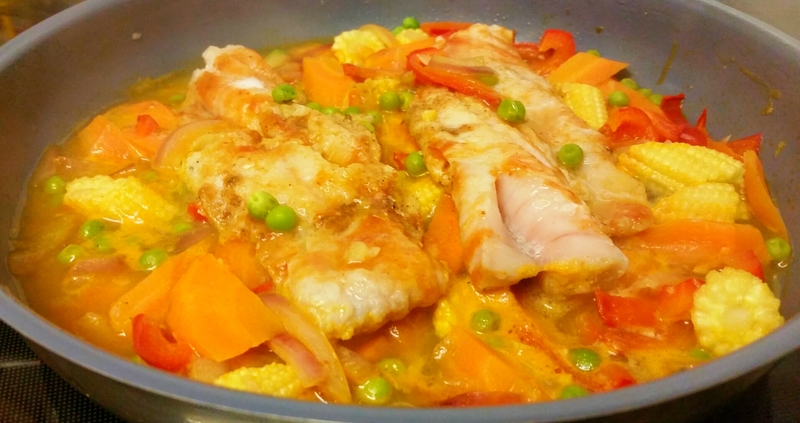 For my next post I have chosen to write about this easy fish dish with vegetables that’s steamed in their own juices. I know that a lot of recipe out there claims to be easy but this really is easy. You could rustle up this in no time and also be able to use fish from frozen. As for the vegetables you are welcome to play around too and use up what’s available. Most vegetables work well here. Over my many attempts, I have used peas, carrots, sweet potato, beans, peppers, sweet corn, baby corn, very thin sliced potato, chopped tomatoes, blanched cabbage, mange trout etc. I have also made this dish with just salt and pepper, with Chinese five spices, with Indian Curry spices and with Thai flavours. They have all worked well so you could use different flavours too experimenting till you come to like one or two. Most of the time I have added a spoon of tomato purée diluted with a tiny bit of water and poured over the top of the fish fillets. I have also semi defrosted the fish in a microwave but if you are using thin fillets then I have also cooked from frozen and have had great results. 3 tsp of Chinese five spice mix or Indian Curry powder or Thai 7 spice mix. Heat a frying pan that has a fitting lid. Add a about a tablespoon of oil. When hot add the garlic and after about 30 seconds add onions. Stir for a minute and add the rest of the vegetables. Stir fry for about 2 minutes. Now place the fish fillets on top and add the salt. Sprinkle the spice and top with the tomato purée diluted in about 5 tablespoons of water. Add black pepper (or chilli powder if more heat is desired) and add lemon grass or lime leaves if using Thai flavours. Now cover with a lid and cook till done. This usually depends on the thickness of the fish and if it was frozen or not. Just check after 10 minutes and then cover and cook more if required. Don’t over cook the fish as it will also continue cooking. drizzle with some fresh lemon juice and serve immediately. ps. I have created a 13 second video highlighting the process and show you how easy it is to prepare this dish. Please follow the link to view it on my Instagram feed.